What can be more fun than pretending to be a waiter or waitress? Ok, so maybe that's not your ideal video game. But how many times have you seen a kid pretending to be one when the family sits down for their evening meal? Happens quite often, right? Perhaps the kid knows something we don't. Enter Diner Dash, game launched in 2004 on the PC as a flash based title - the franchise now has over two dozen titles on seven different platforms including the DS, Wii, and now the Xbox 360 and PlayStation 3. The latter version were just released downloadable format, and feature the classic game with spiffy 3d graphics and online play. 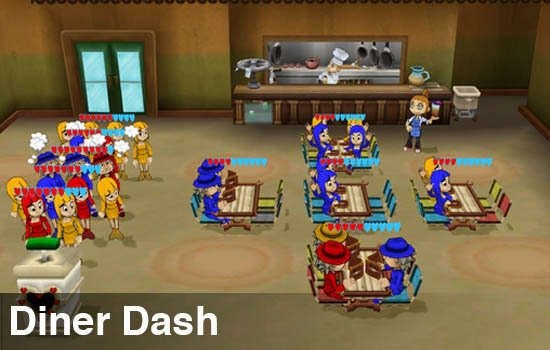 The goal of Diner Dash is simple, place people at tables, take their order, serve their order, and clean up after them. So while the basic gameplay is incredibly simple, to master the game you have quite a bit of depth. There's a handful of different styles of people that come into your restaurant, each one has different needs and speeds at which the needs are to be handled. Customers have colors, and matching these colors to chair color gives you bonus points. There's items like radio, entertainers, and soda that keep them happy while they wait. And happiness is the key - if your customers aren't happy they won't tip well, or worse, they'll leave. Diner Dash on Xbox Live and PSN offers a two player co-op mode called "endless." In it, you and another Flo, that's your waitress, are tasked with surviving the onslaught of hungry customers for as long as possible. Available offline for couch co-op, or online it's a mode that can eat up a lot of your time. As you reach point milestones you'll increase a level, be offered an upgrade to your restaurant, and then have the difficulty increase. With the mode being called endless, I can only assume that the levels are infinite. My partner and I managed to get to level 16 before calling it quits, as we had mastered the art of serving - and didn't see an end in sight. The real advantage to co-op play is that players can specialize tasks, which not only makes playing a bit easier it increases your score. If one player decided to just seat and take orders, and the other player serves and cleans up, you'll be able to rank up multipliers on your tasks pretty quick. The multipliers are the other way to earn big points, by repeating the same task in succession you're multiplier will go up by one each time. So while Diner Dash isn't exactly the game for someone that's a fan of Call of Duty: Modern Warfare 2, it is a game that can be shared with anyone. The concept and controls are simple enough that a seven year old would have no problem playing, and furthermore, will probably really enjoy it. There's good reason Diner Dash has become so successful. It follows that casual formula that takes fun games and makes them addictive. What is that? Simple to play, hard to master. That's exactly what Diner Dash offers, and it offers that for just about anyone. Page created in 0.9691 seconds.